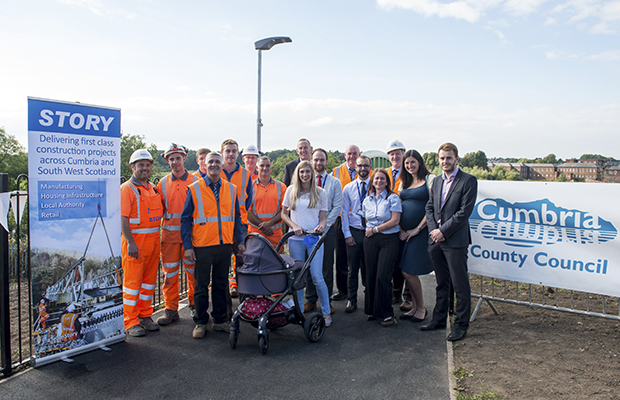 The new cycleway bridge connecting Denton Holme and Currock, constructed by Story Contracting for Cumbria County Council, has been officially opened. Project works started back in January and were completed over the weekend with the removal of the old time-expired bridge during a night shift. 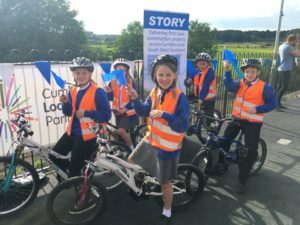 County Council Leader Stewart Young and Denton Holme City Councillor Hugh McDevitt cut the blue ribbon and pupils from the local Robert Ferguson Primary School then cycled over the bridge (wearing their STORY high vis vests!) to mark the official opening. 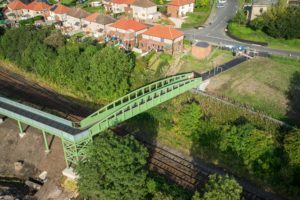 Councillor Stewart Young said: “The new bridge looks fantastic and offers full access for pedestrians, cyclists and wheelchair users. Residents and councillors have been campaigning for this improvement for many years, so this is a real red letter day for the local community. I’m absolutely delighted we now have a bridge that’s fit for purpose and will make it much easier for people to get around and travel to work and school. The new bridge vastly improves both the accessibility and scenery of the area.